There would be Couchsurfing events for four days, and today it was, among others, a treasure hunt, a picnic and a full moon party. As it was time to switch host I took my gear with me and went to the graveyard where the treasure hunt would be. 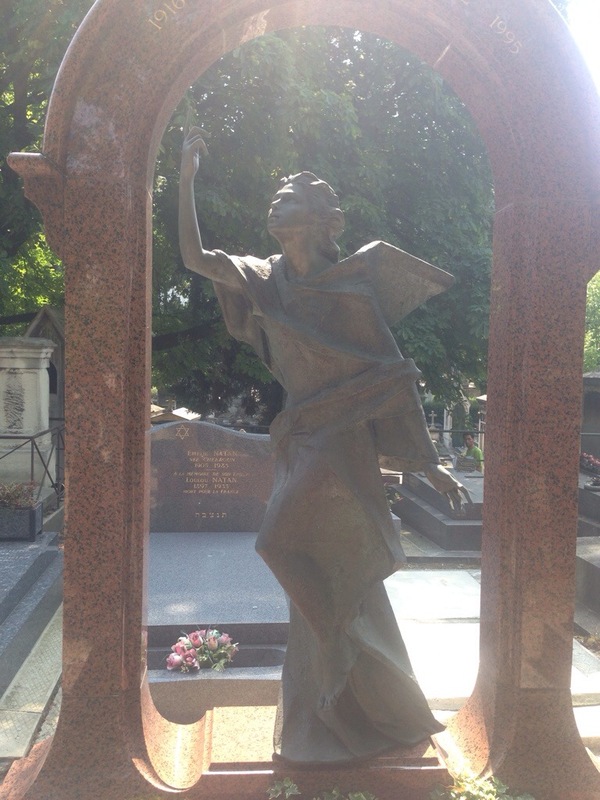 The graveyard was called Cimetière de Montamartre and is apparently a place for tourists to go to as many famous people are buried here. The things we were looking for were persons, languages, dates and different statues and decorations. It was nice, but as the weather made it unbearable for me, I went back to my bike half an hour earlier than the end. The heat is really taking it out of me! When the treasure hunt had ended, I went to my next hosts place to put all my stuff there before the evening. Christophe is a really nice guy with a sense of humour, and he had many tips that will help in Paris and also other countries (now I got more wifi wherever I go, for example. Really good for communicating as I do not buy SIM cards!) and also has knowledge about the city. I borrowed him my bicycle pump as his was not doing well, so we could pump up the tires in the bike he had just changed the tube in. Later in the evening I was going to the picnic and Christophe were going to some friends so he gave me a ride in on the scooter. It is fun to be able to experience all the different ways of transportation, and this one I think I would not try alone! 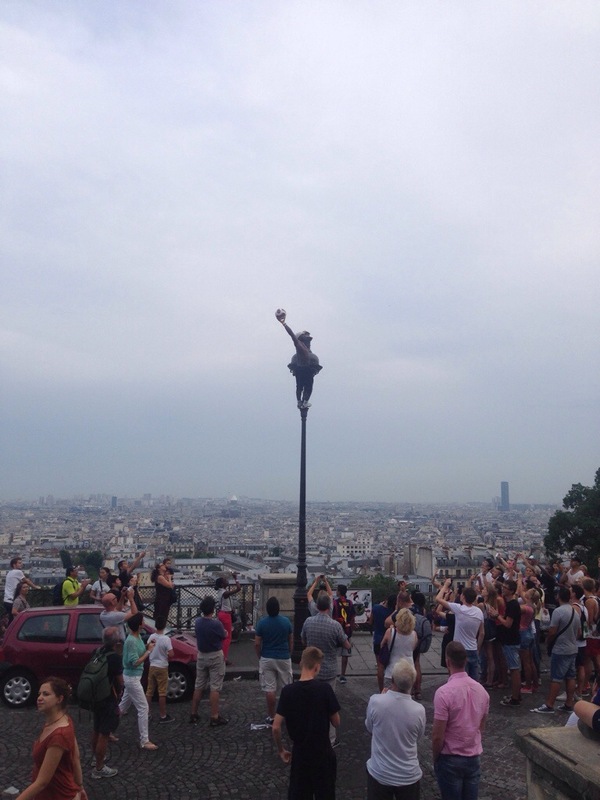 There was a really strong guy performing various tricks with a foot ball, inclusive holding the ball with one foot and set himself perpendicular to the lamp post with only his arms! I was really tired after last night so after some hours I just slept a bit on the grass until we were heading to the next place, the night club. The walk there was good as I got to talk to even more people but I did not like the club at all. It was really crowded and high music everywhere so not my type of place to be at. Christophe came to club but the line was long and it did not seem worth to get in at that crowded place so we went home. He gave me a really cool tour on the scooter, showing me both buildings and telling me about historical events that happened on different places, and also what was the oldest monument in Paris (or even France). 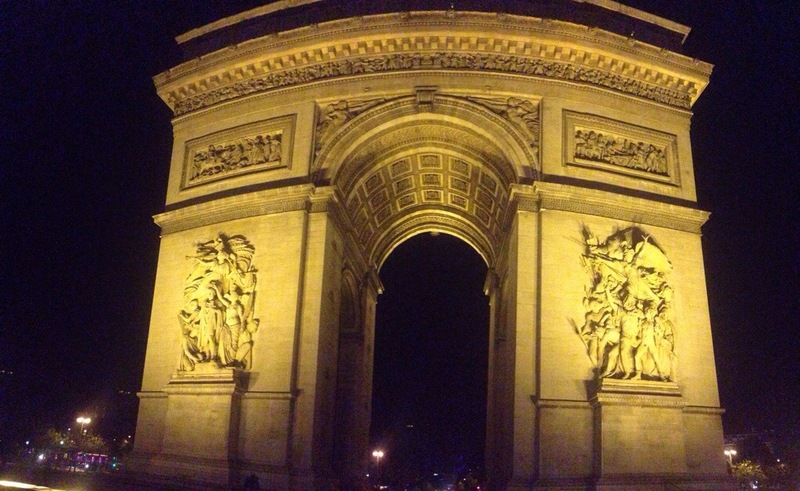 We then went to see the Arc de Triumph, and it really is huge, and looks better by night! After that, it was time to get home and go to sleep! Thanks for the really nice trip, Christophe!